Avocado farmers in the rolling hillsides of Mexico’s Michoacan state are not worried for now by U.S. President Donald Trump’s threats to tear up a trade deal which could make the favorite snack of Super Bowl viewers more expensive. Americans will chomp through huge amounts of avocados mashed into guacamole during the Super Bowl on Sunday, and 80 percent of those fruits will come from Mexico’s ever-larger expanse of orchards, thanks to a free market created by the North American Free Trade Agreement in 1994. It is peak season for guacamole, a word that means avocado sauce in Mexico’s native Nahuatl language. Some 100,000 tonnes of the green fruit, or 12 percent of annual U.S. demand, will be consumed on Sunday and in the days before and after the New England Patriots game against the Atlanta Falcons, exporters say. With such market dominance and demand, growers like Adrian Iturbide doubt Trump’s eagerness to impose duties on Mexican goods will dent exports. They feel they have little to fear from proposals by the Republican such as a 20 percent blanket tariff on U.S. imports from Mexico, that would affect sales of “green gold” to the northern neighbor. 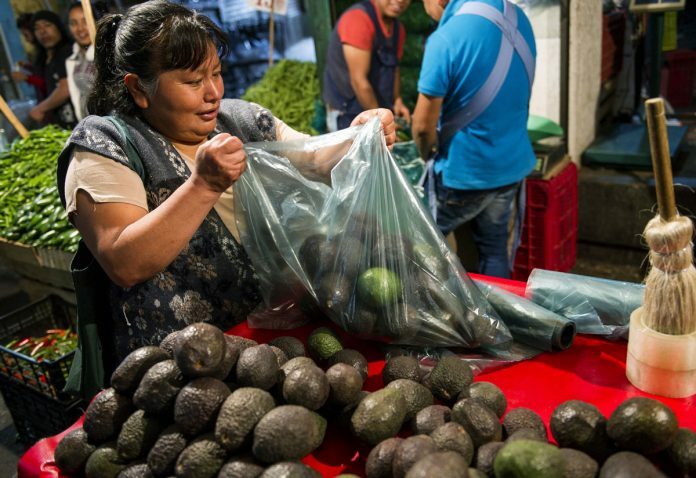 “If Michoacan decided for whatever reason…to stop exporting, there is nowhere else in the world that could provide the quantity of avocados that U.S. markets are consuming,” said Iturbide. Luckily for growers like Iturbide, U.S. consumers do not significantly reduce the amount of avocados they buy when prices go up, a 2013 study found, even though they do increase purchases when prices go down. Of course, that could change if avocados became unreasonably expensive. 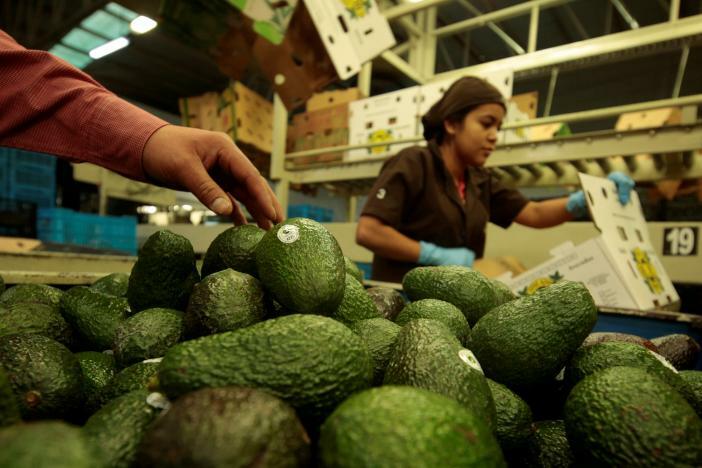 While Mexican producers are confident they can ride out price hikes, Trump has another weapon to threaten the avocado industry if he chooses to use it. Rules allowing the United States to clamp down on imports citing health concerns limited Mexican exports for the first 13 years of NAFTA in what Mexico considered veiled protectionism. Within Mexico, the world’s largest avocado producer, Michoacan is by far the biggest grower, and one of only two states whose avocados are certified to export to the United States under strict rules to limit the spread of diseases. Iturbide, who now exports up to 90 percent of his production, nearly sold his orchards before NAFTA made exports possible and prices rose. He is not immune from the nerves that have spread through Mexican companies about a possible shut down under Trump. “We hope that everything stays as it is, for the good of the avocado, for the gringos and for us,” he said. Native to Mexico, the avocado is an apt symbol for closer Mexico-U.S. ties under NAFTA. Mexican imports of avocados to the United States were fully opened up 10 years ago, just as reports about health benefits pushed the fruit’s popularity to unimagined highs. Avocado fever has since gripped Michoacan, with sprawling avocado orchards replacing pine forest, a trend that worries environmentalists but has also provided a decent income for thousands of people in a region known for migration to the United States and drug trafficking gangs. More than $1.5 billion worth of Mexican avocados are sold in the United States yearly. Guacamole has become so synonymous with Super Bowl parties that the marketing organization Avocados from Mexico ran prime time commercials during the game for in 2015 and 2016, and will again this year – a high profile challenge to Trump’s verbal volleys about a $60 billion U.S. trade deficit with Mexico. Avocados for Mexico is a venture between Mexican exporters group APEAM with the U.S.-based Mexican Hass Avocados Importers Association, MHAIA. Avocado demand has soared and last year prices spiked after the El Nino weather phenomenon affected harvests in Peru and elsewhere. U.S. restaurant chain Chipotle Mexican Grill (CMG.N) said in January that rising avocado prices had dented profits. Last year the chain said it would not pass on higher prices to customers. Mexico is now targeting the 2018 soccer World Cup as the next event where thousands of tonnes could be sold, and Agriculture Minister Jose Calzada last year announced a new avocado marketing office in Russia. Last year Mexico ran an avocado ad in Japan. “We have been working for some time on diversifying the market, and a tariff could make it more interesting for us to reach other markets, because prices would be more competitive,” said Ramon Paz, spokesman for APEAM. Mexico exports 1 million tonnes of its annual 1.8 million tonne output, more than $2 billion in total, with 860,000 tonnes of that going to the United States. Japan and Canada are the next most important markets. “The market growing the fastest is China. It’s still not big, but it is doubling consumption every year,” Paz said.